The ISO L8R 155 stand (pictured) is a great way to support the IOTA when used on a shelf or desk. 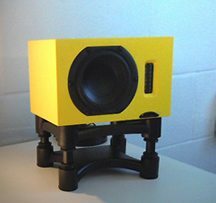 The top-plate section is a perfect fit and the suction type feet keep the speaker firmly in place. The stand can be tilted backwards or forwards.